Posted on February 5, 2019 February 5, 2019 in Press Release. Mohave Community College has created a series of four-hour classes that will help teach workforce readiness skills identified by employers locally and across the state. The courses focus on seven core skill areas that comprise Governor Doug Ducey’s Arizona Career Readiness Credential, commonly referred to as the ACRC. The courses cover career readiness skills employers desire and include applied mathematics, reading for the workplace, workplace data and graphics. There are also employability soft skills that include conveying professionalism, collaboration and teamwork, communicating effectively, critical thinking and problem solving. MCC has also developed a course that serves as an overview and provides summaries of all seven core skill areas. Hindenach has also helped the college put together a separate series of classes for individuals seeking to hone their skills in order to transition into management positions. There are also classes for mid-level and senior executive level managers with ten or more years experience. The Management Training and ACRC will work hand in hand to help support the regional workforce and economic development. In Mohave County, the ACRC core partners include the Governor’s Office of Economic Opportunity, Kingman Area Chamber of Commerce, ARIZONA@WORK, Small Business Development Center and Mohave Community College. 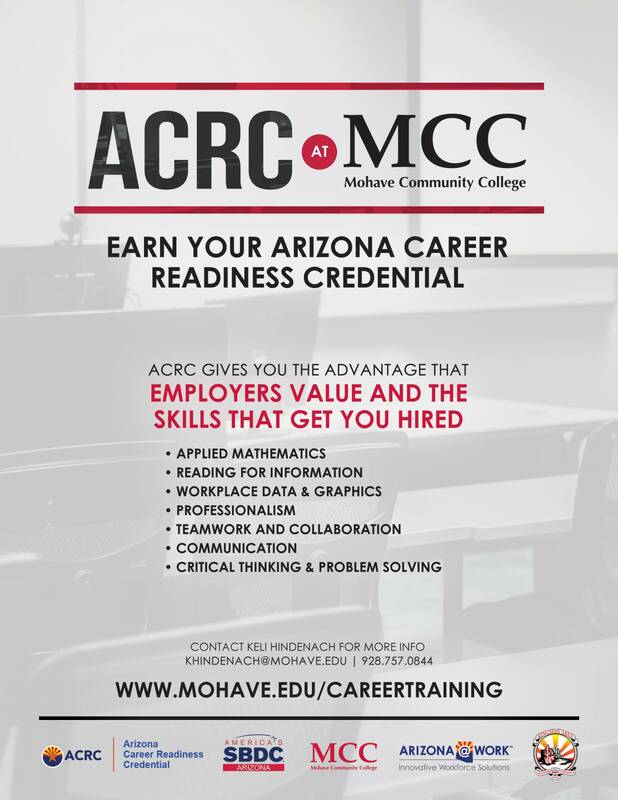 You can find more information about ACRC and the Management Training series at the college website www.Mohave.edu/CareerTraining, or by calling 1-866-MOHAVECC and asking for Keli Hindenach.